Two heavy hitters, journalist Lawrence Wright and director Alex Gibney, miss the mark in My Trip to Al-Qaeda. 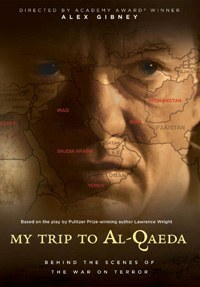 My Trip to Al-Qaeda is a documentary film by Alex Gibney based on a one-man play of the same name by journalist Lawrence Wright, although the theatrical performance in question is really more of an illustrated lecture than a play in the conventional sense of the word. In it, Wright combines autobiographical details about his work in the Middle East with lots of news clips and other documentary materials intended to take the audience on an abbreviated version of his own journey as he tries to understand Islamic terrorism and the American response to it. 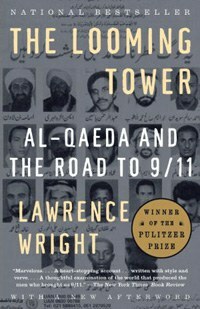 Wright is the author of a well-regarded book on the subject, The Looming Tower: Al-Qaeda and the Road to 9/11, which won the 2007 Pulitzer Prize for General Nonfiction, so you’d think he would have some deep, or at least novel, insights to share. Unfortunately, he offers little in the way of information or opinion that hasn’t been heard before. The result is that the interest of this documentary lies primarily in its format and in the personality of its narrator. Here, I’m afraid, My Trip to Al-Qaeda comes up far short. Perhaps some viewers will find Wright’s stage personality charming, but I found his aggressively earnest tone and his determination to hammer home points that are already obvious, like a secular preacher before a none-too-bright congregation, irritating in the extreme. More problematic, Wright never came close to convincing me that he actually wanted to understand the roots of terrorism, because to truly understand something so complex you have to get out of yourself and see the world as others see it, something he never seems to have been willing to do. Maybe his book is more gratifying in this respect, but in this play he’s willing to settle for dropping in bits of journalistic information side by side with his personal narrative (did you know he taught English at the American University in Cairo? And wrote the screenplay for The Siege?) while largely missing the broader social context that helps foster modern terrorism. Wright almost sees the limitations of his own point of view when showing a clip from the 1991 Gulf War of American soldiers kicking down the gate of a Saudi family’s home, evicting them at gunpoint, and forcing them to kneel. This could have been an opportunity to acknowledge that American actions might have something to do with fostering terrorist groups (how many times have similar, or worse, scenes been played out away from the television cameras? ), but for Wright the purpose of the clip is to dwell on the face of the family’s young daughter, and to describe how terrified she is. We can see this for ourselves, of course, but then we wouldn’t realize what a sensitive soul Lawrence Wright is. The kicker of this section is his remark that the clip was played over and over again on Al-Jazeera— “endless, obsessively, ritualistically” in his words—then he declares that this clip presents the theme of the war, from the Arab perspective. First of all, that’s a huge generalization (do all Arabs, including Arab Christians and Jews, really think alike?) and second, maybe it’s really the perspective of civilians from the country where a war is being fought. Who is to say that their perspective is not at least as valid as that of a journalist from the most powerful country in the world? In another clip, he dwells on a 2002 incident in Saudi Arabia in which a number of schoolgirls died in a fire, in part because they were not allow to exit the scene of danger without their headscarves. It’s a terrible story, but Wright fails to mention that there was a public outry followed by a government inquiry and the cleric heading the school was fired. That response doesn’t erase the wrongs done, nor does it really counter the many policies that limit the freedom of girls and women, but it does suggest that not all Saudis (or all Moslems, or all Arabs) believe that it’s better for girls to die than to go outdoors without covering their heads. Wright tries to switch tones near the end of the film, in a segment that begins with him being shocked—shocked! after the FBI questions him about some phone calls to London, and reveals in the process that they know his daughter’s name. It’s a sad demonstration of a principle attributed to Mel Brooks: when I get a hangnail, it’s tragedy. When you fall down a manhole and die, it’s comedy. In this case, it would be: when I suffer the tiniest invasion of my civil liberties, it’s a cause for moral outrage. When you are imprisoned, tortured, or killed by my government, that’s newsreel footage. Wright tries to contradict the tone he established for most of the film, with crescendoing music signaling his moral indignation at the events of Guantanamo Bay, but it’s too little, too late, particularly given his extended dwelling on the horrors committed by Muslims over the course of the film. I won’t spoil the film’s final words, but will say that I found them entirely unconvincing. The title My Trip to Al-Qaeda places me in mind of primary school themes of the “How I Spent My Summer Vacation” variety—I’m not sure that was what the author intended, but it does fit the faux-naïve tone of much of his narration. The title also correctly identifies the framing of the material presented: as is the case with many travel books, the real subject is not the lands and peoples visited, but the author’s experiences there and his or her personal growth as a result (Eat. Pray. Love. by Elizabeth Gilbert is a well-known example of this type of book). The problem with this approach is this—if you don’t care all that much about Wright’s personal growth (and I certainly don’t) then this documentary adds up to a tedious 86 minutes that is neither particularly informative nor sufficiently absorbing. Presenting a filmed version of a play is always a tricky process—you lose the immediacy of the live performance, so you need to find ways to preserve the essential experience of the play while also making use of the greater spatial possibilities offered by film. The experience offered by this documentary is a mixed bag—sometimes you see Wright in the theater, but other times the news clips and interview footage fill the screen, as they would in a typical documentary, and the feeling of being at a live performance is largely lost. There are no extras on the DVD of My Trip to Al-Qaeda, which seems like a real lost opportunity, particularly because the documentary will be screened on HBO and is available on instant view—it would be nice if you got a little something extra when you purchase the DVD.